Who is responsible for the foods we serve for Hanukkah today? The answer might surprise you. Sephardic Hanukkah specialties, many of which consist of deep fried dough flavored with honey and sesame seeds, all originate from a special honey cake introduced to the Levant by Alexander the Great. Judea was conquered from the Persians by Alexander in 332 BCE. It was under Greek rule for 191 years, until the Maccabees created the Hasmonean state in Israel in 141 BCE. The Jews of the upper classes of Judea became Hellenized under Alexander. Josephus explains in his book, The Jewish War , that one of the reasons for the Maccabean revolt against the Seleucid Empire in 167 BCE was a civil war between the wealthy, Hellenized Jews of Jerusalem, and the traditionalist Jews of the countryside. The Hellenized Jews wanted to discard all Jewish traditions, including circumcision, while the traditionalists ferociously guarded their rituals, which ended up sparking a civil war between them. King Antiochus IV Epiphanes sided with the Hellenized Jews, and decided to try to crush the traditionalists. Antiochus’ prohibitions against practicing Judaism and desecration of the Temple led to the Jewish Revolt, which lasted two years. In 165 BCE the Maccabees were victorious. They cleaned, purified, and rededicated the Temple in Jerusalem, and then celebrated the Festival of Lights for eight days. This celebration included feasting, and one of Alexander’s signature treats was on the menu. What foods did Alexander introduce to Judea? Tiganites me meli, “honey cakes,” were believed to absorb alcohol. They remained in the Jewish cuisine in the form of loukoumades, “honey doughnuts,” flavored with sesame seeds, which are served by Sephardic Jews in honor of Hanukkah. Here is the recipe introduced by Alexander. Adapted from The Classical Cookbook by Andrew Dalby and Sally Grainger. Mix the flour, water, and 1 tablespoon of honey in a bowl. Heat the olive oil over a medium flame in a heavy frying pan. Drop a tablespoon of batter into the hot oil. Flip the pancake over when it is golden-brown. When both sides have cooked, place the fritters on a serving platter. Drizzle a tablespoon of honey over them. Sprinkle with toasted sesame seeds. Latkes, potato pancakes, are a quintessential traditional Hanukkah food made of shredded potatoes, eggs and bread crumbs or matzo meal. Like most people I know, I like my latkes ultra-crunchy, perfectly salty, savory from the onion, lacy at the edges and soft in the middle. Traditionally, latkes are fried in oil, which symbolizes the miraculous Hanukkah story and gives them a crispy exterior texture. I do not particularly fancy anything fried, though. I will indulge myself from time to time, but am not too enthusiastic about the mess and hassle that comes with frying, not to mention the emotional heartache that comes along with it. Oven-baked potato pancakes are a safer, healthier and less hassle alternative for me. If you are looking for a traditional potato pancake recipe, you are out of luck: All I have for you is a multi-vegetable pancake recipe, which seems more exciting to me. Plus, people seldom complain about eating too many vegetables, and a couple extra never hurt anyone. Carrots and zucchini balance out the starchiness from the potatoes, which is why I included them. A dollop of low-fat sour cream, applesauce and smoked salmon adds a nice finishing touch. After grating the vegetables, drain excess water using paper towels. Add the remaining ingredients and mix well. Flatten with back of spoon, slightly, so that latkes will be cooked through. Brush each patty with oil or spray with cooking spray. Bake uncovered for about 10 minutes. Bottoms should be browned and crisp. Turn latkes over and bake for 8-10 more minutes. If you are worried about browning on the second side, give pan another “brushing” with a thin coat of oil, and then lay latkes back down. Keep an eye on the latkes as they bake to avoid overcooking. Serve right away, or store covered to reheat the next day at 350°F for 10-15 minutes. Challah Maidel blogs about healthy kosher eating. Speaker of the Knesset Yuli Edelstein participated in a special Hanukkah candle-lighting ceremony for the sixth night of Hanukkah, together with several Cabinet Ministers and Members of Knesset. The ceremony was also attended by 60 Lone Soldiers, arranged by Nefesh B’Nefesh, Friends of the IDF (FIDF), Tzofim Garin Tzabar, and Ha’aguda Lema’an Hachayal (The Association for the Welfare of Soldiers). I’m happy and thrilled to be here to continue the tradition of lighting Chanukah candles in the Knesset. The lighting of the candles symbolizes the freedom of the people of Israel, and is especially relevant here in the Knesset because we have our own parliament, and despite all the disagreements that take place in it, we have the freedom to govern ourselves. Five Lone Soldiers joined Edelstein as he lit the Chanukah candles. The soldiers, who are originally from Turkmenistan, Kazakhstan, France, Japan, and Uruguay made Aliyah to Israel to join the IDF with the support of Nefesh B’Nefesh and the FIDF. We are honored to have the Knesset Speaker light the Chanukah candles with these Lone Soldiers, in this symbolic salute to all those who left their families and homes in order to make Aliyah and serve the Jewish State through the Nefesh B’Nefesh/FIDF Lone Soldiers program. Mayor Michael Nutter joined the festivities as enormous Hanukkah Menorahs were lit at Philadelphia’s 30th Street Station and on Independence Mall. The Philadelphia Lubavitcher Center says the Menorah on Independence Mall is the largest menorah in the world. Photo of the Mayor Nutter and the 30th Street Station Menorah by Gabrielle Loeb. Videos of the National Menorah lighting near the White House follow the jump. Next Thanksgivukkah in 80K Years? Wrong! The upcoming convergence of Hanukkah and Thanksgiving is not quite as rare as some have claimed. So what has made this fallacy viral, and how does it happen that there were also times in years gone-by with convergences as well? The magic struck last November, when Dana Gitell, a marketing specialist at NewBridge on the Charles, a Dedham retirement community, was driving to work. She knew the holidays were going to overlap this year “because I had seen a list of holiday dates on the back of a Combined Jewish Philanthropies calendar,” recalled Gitell, the wife of Seth Gitell, a former Menino press secretary now working for House Speaker Robert A. DeLeo. She was mentally running through a list of clunky names for the phenomenon — Hanukkahgiving? — when the more melodious Thanksgivukkah came to her. An article in Haaretz noted that she did not have permission to use the image she chose and received a cease and desist order on October 5. Mathematicians disagree about recurrence dates on their websites, so it does take work to arrive at what seems to be a truly accurate answer. The most helpful site seems to be of the three Lansey brothers, whose blog with correct information was already online in 2012! These three brothers did historical research on past dates of Thanksgiving, and posted the years listed in the table above when Thanksgiving and Hanukkah overlapped. The years 1945 and 1956 are marked with an asterisk because those were only Thanksgiving in certain states that maintained the date for Thanksgiving adopted by President Franklin D. Roosevelt (and mocked as Franksgiving). That date was nullified in 1941 by an act of congress settling it into the 4th Thursday. Chanukah-before-Thanksgiving occurred in the past, and with decreasing frequency as time went on, is because there is a slow drift between the Hebrew Calendar and the secular (Gregorian) calendar. That drift amounts to one day every 217 years. So in about 80,000 years it will drift by one full year and we’ll be back to where we started. At that time we will once again be lighting Chanukah candles at our Thanksgiving dinner. … when the fruit had not grown properly, when the winter rains had not stopped, when the roads for Passover pilgrims had not dried up, and when the young pigeons had not become fledged. The council on intercalculation considered the astronomical facts together with the religious requirements of Passover and the natural conditions of the country. — Comprehensive Hebrew Calendar , p. 1-2. Hillel II established a fixed calendar based on mathematical and astronomical calculations. This calendar, still in use, standardized the length of months and the addition of months over the course of a 19 year cycle, so that the lunar calendar realigns with the solar years. Adar I is added in the 3rd, 6th, 8th, 11th, 14th, 17th and 19th years of the cycle. The current cycle began in Jewish year 5758 (the year that began October 2, 1997). If you are musically inclined, you may find it helpful to remember this pattern of leap years by reference to the major scale: for each whole step there are two regular years and a leap year; for each half-step there is one regular year and a leap year. This is easier to understand when you examine the keyboard illustration below and see how it relates to the leap years above. It’s nice to note that some of the children alive today will be here for the next Thanksgiving-Hanukkah convergence. May it be so! Addendum: There are some who wrote well-publicized articles that overlooked the evening overlap of these festivals. Jewish holidays start at sundown and secular holidays start at sunrise. They wrote their articles declaring a never-to-be-repeated event by disregarding the almost 8 hours of convergence the evening before. Which to my mind is odd for Jewish writers to do, given we know that the evening rituals and meals of both Hanukkah and Thanksgiving are the spiritual main events. For Jews, given that sundown is approximately 4:19 pm, we will be lighting our menorahs and then eating our latke-stuffed turkey dinners (or whatever fusions evolve over time) there-after. Evening convergences have happened in the past, and will continue to do, as the table at the article’s beginning demonstrates. Filming and Vocal Recording: Yosef Adest. Lyrics follow the jump — sing along! I can still remember how that oil used to last a while. And I knew if it made it eight. And then we’d be rejoicing with a smile. But this year’s just unprecedented. A holiday that’s so demented. It doesn’t get more quirky. From Jewish and American pride. My apple pie is extra fried. The day the chags collide. So try my new Thanksgivukkah pie. It’s delicious, not nutritious, and it’s so good you’ll cry. Like soofganyot, it is super deep-fried. So don’t eat more than one or you’ll die, don’t eat more than one or you’ll die. And mashed potatoes with sour cream. We remember stories from so long ago. But save some room for mac and cheese. We can watch by candlelight, oooh. Cause it’s happy times for US Jews. So tell your friends and spread the news. Or maybe I mixed up my facts. And we spin the turkey which wobbles proud. I think I’ve lost my mind, got to relax. With the Macy’s Hanukkah Parade. The floats are on the go. So gather round with all your friends. Sing Maoz Tzur until the end. And stuff yourself, I recommend. My students ask me, “Rabbi Goldie, just what gives? By the dreidel’s spin, you’ll have to abide. If your dreidel lands on the Hebrew letter Hey-and you answer correctly, you get to take half the “pot”. Is Thanksgiving based on a Jewish festival, and which one? Should your dreidel land on the Hebrew letter Shin (outside of Israel) or Pei (in Israel) — if your answer is incorrect, half goes back into the pot. What was the first of the three miracles of Hanukkah? If your dreidel lands on the Hebrew letter nun, for a wrong answer, all your winnings go back into the pot. Does Hanukkah commemorate the first known dedication of the Temple? A correct answer when your dreidel lands on Gimel let’s you take everything that’s in the pot. Whose idea was it to make Thanksgiving an American National holiday? Bonus Question, right or wrong, everything in each person’s pot goes straight into the tzedakah box! When is the next time the first night of Hanukkah and Thanksgiving will coincide? Check your answers and record how well you did after the jump. 1. Is Thanksgiving based on a Jewish festival, and which one? Some readers may have seen Internet articles suggesting that Thanksgiving originates from the Biblical harvest holiday know as Sukkot. The timing is usually close enough to make this seem plausible. The Puritan’s did not believe in fixed holidays. If it was a good season, they would announce a thanksgiving, but it’s not like the Jewish holiday which occurs on the 15th of the month of Tishrei (Sukkot). They did not believe in that. The Separatists at Plymouth did not create an annual holiday [of Thanksgiving]. Rather, a holiday that grew in popularity and stabilized into an annual celebration over the course of several decades was later traced back to an event that took place at Plymouth in December 1621. Puritans accepted the Sabbath but rejected all other holy days in the Five Books of Moses as being given by God for only Jewish observance. The Puritans practice was to declare of day of thanks giving when the harvest was actually good, they did not adhere to regular festivals, it was not their way. 2. What was the first of the (at least) three miracles of Hanukkah? The original “miracle” of Hanukkah was the collaboration of the tiny handful of remaining religious Jews with the vast number of non-observant Jews of the time to wrest Jewish sovereignty over Israel back from the occupying Syro-Greeks. During the days of the Greek Kingdom, the Hasmonean [Maccabees] entered the sanctuary, rebuilt the altar, repaired the sanctuary’s walls, replaced the sacred vessels and were engaged in its rebuilding for eight days. So, we this is one source for knowing they were engaged in purifying the Temple. And the next miracle is that the Hasmoneans, known for their extreme (and later horrifically fanatical) piety, underwent a surprising shift in consciousness. Instead of waiting for the fire to come down from God to rekindle the altar, they lit it themselves. So where did the idea of the miracle, of the little flask of oil lasting specifically eight days, come from? Now our story has gone full circle: It could have come from Sukkot! Another colleague of mine, Brian Field, reminded our rabbinic discussion list last week that this connection can be found in preserved texts that are not part of the Jewish canon. They are collectively known as the Apocrypha. Celebrated the occasion [of winning back the Temple in Jerusalem] after the manner of the Festival of Tabernacles [Sukkot], and decreed that the eight-day festival in honor of the [Temple’s] purification. What is the reason for Chanukah? For our Rabbis taught: On the 25th of Kislev begin the days of Chanukah, which are eight, during which lamentation for the dead and fasting are forbidden. For when the Greeks entered the Temple, they defiled all the oils in it, and when the Hasmonean dynasty prevailed against and defeated them, they [the Hasmoneans] searched and found only one cruse of oil which possessed the seal of the High Priest, but which contained sufficient oil for only one day’s lighting; yet a miracle occurred there and they lit [the lamp] for eight days. The following year these days were appointed a Festival with the recitation of Hallel [specific psalms] and thanksgiving. 3. Does Hanukkah commemorate the first known dedication of the Temple? 1. The Hanukkah of finishing creating the heaven and earth, which God observed by “turning on” the two great lights (the sun and moon) in the sky (Genesis 2:1, 1:17). 2. The Hanukkah of completing the wall enclosing Jerusalem (Nehemiah 12:27), observed with lots of singing. 3. The Hanukkah of the successful return from Babylonian captivity (Ezra 6:17), observed with lots of singing and offerings. 5. The Hanukkah of the World to Come (Zephaniah 1:12-1), in which the wealthy and unjust are utterly annihilated by God, accompanied with the sound of crying, this time cries of sorrow, not joy. 6. The Hanukkah of the princes’ anointing the altar (Numbers 7:84-89). After all twelve princes finished bringing their offerings of silver and gold items, the whole array, clanging mightily, we might suppose, accompanied by the bellowing of the sacrificial oxen, was followed with what one might call, “the still, small voice” that Moses hears from beyond the ark’s cover. 4. Whose idea was it to make Thanksgiving an American National holiday? It turns out the idea came from a woman, Sarah Josepha Hale. Several presidents ignored her missives petitioning for such a national holiday. Before her time, President George Washington held a national day of Thanksgiving, but did so only once. Various states, mainly in New England, had Thanksgiving celebration traditions, but held them on days different to each other. So which president took Sarah Josepha Hale up on her suggestion? You may have observed that, for some years past, there has been an increasing interest felt in our land to have the Thanksgiving held on the same day, in all the States; it now needs National recognition and authoritative fixation, only, to become permanently, an American custom and institution. She also lobbied the presidents with pressure from her readers. Our national holiday of Thanksgiving was established in response to her letter and because it served the strategic interests of the President, as the decision came came in the midst of civil war and several months following the Emancipation Proclamation. He declared Thanksgiving to be a national holiday on October 3, 1789 — 74 years after George Washington, and 243 years after the pilgrims landed on Plymouth Rock on December 21, 1620. Bonus Question: When is the next time the first night of Hanukkah and Thanksgiving will coincide? The first night of Hanukkah will fall out during Thanksgiving dinner-time in 2070, and then again in 2165. Previously there were overlaps in 1888, 1899, 1945 and 1956, and since some states would, in days gone-by, use different Thanksgiving dates to the majority of the nation, there were two more overlaps as well. Since Thanksgiving has not always been held on the same day of the same week each year in the past, figuring this out is not as simple as it might seem. To further complicate matters, those of us sitting down in gratitude to Thanksgivukkah’s latke-stuffed turkey dinners at roughly 4:19 p.m. after the first light of Hanukkah is lit in 2070, may be surprised that Joel Hoffman does not count first night overlaps as valid. In his late-coming Nov. 24 article, Why Hanukkah and Thanksgiving Will Never Again Coincide Again, he only counts as valid whole days, not erev — “evening” overlaps. From a ritual point of view, that view is hard to swallow. 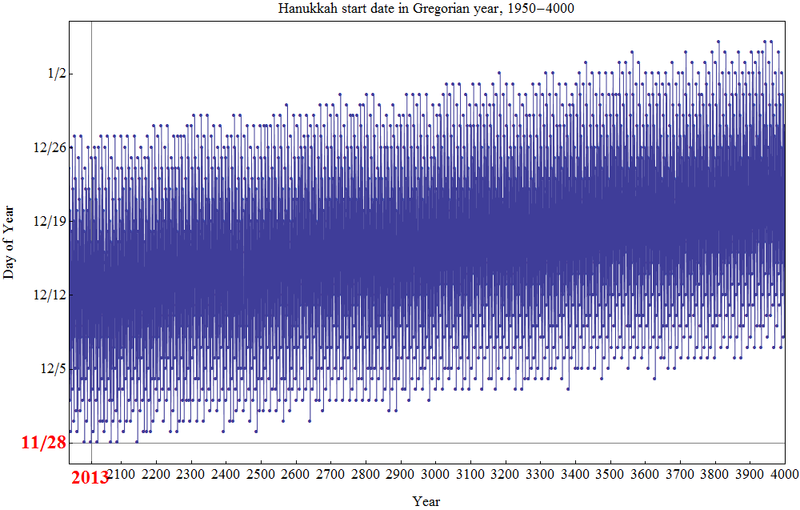 It is true that after the first night of Hanukkah overlaps of 2165 and 2070, no degree of overlap is presently scheduled to occur for tens of thousands of years into the future. This is because of the gradual drift between the secular solar calendar and our Jewish lunar calendar. However, Jewish calendar adjustments are made from time to time to ensure Jewish holidays align with their intended seasons, so likely, that too will change. Learn more in our article, Next Thanksgivukkah in 80k Years? Wrong! Nu? Did you have a good learning? when the origin stories we were raised with just do not square? Where do you stand on this cosmic convergence? Is it more than just a bonanza for merchants? to have gratitude that we are only spinning a dreidel, for we get to stay dressed! What happens when Thanksgiving and Hanukkah become one monster holiday? The parody tallier for “Thanksgivukkah: The Movie” was written by Yisrael Campbell, Gary Rudoren and Daniel Smith, and produced by Shoot East. Campbell also stars in the video alongside Amihal Hazony, Sharon Katz, Deb Kaye, Aharon Naiman and Marni Schamroth. A calmer parody video after the jump.